Abraham-Louis Breguet founded his eponymous company in 1775 in France. Soon after he had to flee the country after the revolution erupted which also led to the demand of his watches by its main European markets to decline. His friendship with the Ottoman ambassador to Paris, Esseyd Ali Effendi and the growing interest towards European watches allowed him to present the country’s elite with his creations. After Effendi returned to Turkey in 1802 he commissioned A.-L. Breguet with a great number of watches. Subsequently the two men worked together to adapt the watches to the Turkish market’s requirements. 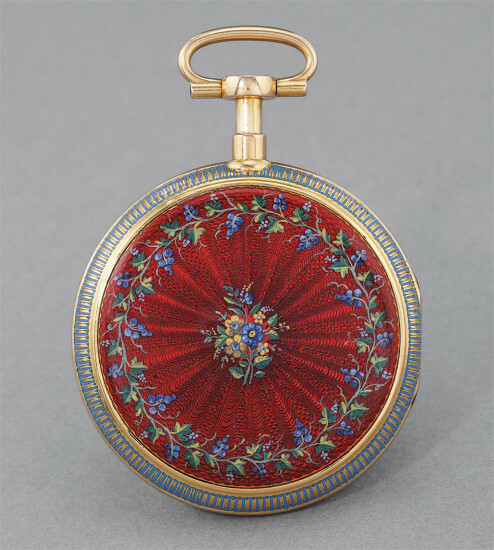 They should feature white enamel dials, sumptuously decorated cases in vivid colors such as red and more practically a double case to protect the watch, as the Ottomans used to wear their watches outside their clothes. On the dial side, a major style adjustment was conceded by A.-L. Breguet, the watches designed for the Turkish market was now featuring Breguet designed Eastern Arabic numerals instead of the more conventional Roman or Arabic numerals. The present Turkish Quarter repeater pocket watch is part of the very early watches commissioned by Esseyd Ali Effendi to his trusted friend Abraham-Louis Breguet. Thanks to Emmanuel Breguet, Head of Patrimony & Marketing, we were able to discover that the Breguet 1351 was sold on 18 Fructidor an 12 of the French Revolution calendar which means September 5, 1804 to Mr Esseyd Ali Effendi for the sum of 1992 Francs. Over the course of its life, the watch returned to Breguet workshops in Paris four times: in 1861, 1876, 1877 and finally in 1959 where a certificate was issue to the London based owner at the time. This amazing piece of horological history is presented at auction in excellent condition. The enamel color on the cases is vibrant and flamboyant, the white enamel dial with the Eastern Arabic numerals is pristine and the Breguet secret signature will be revealed to the fastidious collector. The watch is complete with both cases, the winding key and the Breguet fitted presentation box adorned with the watch number.